I'm glad you like the chapter. “We made a pact to always be there for each other. To trust each other. And when something happens to always let each other know,” Liz said. “Yes I remember the pact. What pact did you and Max make to each other?” Michael asked. “Max and I made a pack to always stand by each other. To always be there and to always love each other no matter what,” Liz said. “Why didn't you tell me about you and Max?” Michael asked. “Because we were worried about what you and our parents would say. Michael the thing you and Max don't know is that the night Max and I got married on secret was the night that Senior Rath was planning to marry me off to Kivar,” Liz said. “How did you find out?” Tess asked. “Rose's ghost told me. She relives everything that happened from the night Max and I got married till I saw her. Rose and Zan are trying to break what happened. But they can't,” Liz said. “OK. I understand that. But why did you not tell me you and Max were married before the war?” Michael asked. “Because I knew you would be pissed. Max and I love each other so much that we didn't want to wait till I was 18. We wanted to get married now. So we did. Michael please please don't hurt Max. I love him with all my heart and soul,” Liz said. “And I love Liz with all my heart and soul too,” Max said. “Fine. I won't hurt Max. But if he hurts you then I will hurt him got it Max?” Michael asked. “Yes I got it,” Max said. Liz ran up to Michael and hugged him. Michael wrapped his arms around Liz and started to cry. Liz took a step back and looked at Michael. “Michael why are you crying?” Liz asked. “I just found my sisters and I lost them,” Michael said. “Michael you didn't lose us. We are still your sisters. But we are married now,” Liz said. “Please don't remind me?” Michael said. “Sorry. But you know we love you,” Liz said. “Yeah I know,” Michael said. Liz turned and looked at Max. Then she walked up to Max and they both looked at each other. “Liz I wanted to say I love you,” Max said. “And I love you too,” Liz said. Then they both turned and looked at Cal. Cal was looking at them then looking around. Cal walked up to Max, Liz and the others. “Cal all I wanted to say is thank you for looking out for Liz, Serena, and Ava. You are a great uncle to them. And I'm glad you were there for them,” Max said. “Um thanks. I think,” Cal said. “Yeah I agree with Max. Thank you,” Michael said. “OK. Now that we are through with all of this what are we going to do?” Larek asked. “Well I think it is wise to say that we have a lot of training to do with our new team. What do all of you say?” Cal asked. “Where are all of you staying?” Ava asked. “We haven't found a place yet,” Parents said. “Well you can all stay with me at my house,” Cal said. “What about Liz, Serena and Ava?” Michael asked. “Well we are staying here while all of you go to Cal's house,” Liz, Ava and Serena said. “Wait just a damn minute,” Max and Michael said. “Oh brother,” Liz, Ava and Serena said. Right at that moment Liz and Ava turned and saw a man walk into the club. They watched as he stood by the door watching. “Cal?” Liz and Ava asked. No one heard them. Liz and Ava watched as the man started to walk toward them. “Cal?” Liz and Ava screamed. Max, Cal and the others turned and looked at Liz and Ava. “What is it?” Cal asked. Liz and Ava pointed towards the door. Everyone turned and looked at the door and saw a man walking towards them. “Who the hell are you?” Max asked. “Oh I just came to see if the rumor is true. And I see it is,” Man said. Liz, Ava and Serena walked and stood in front of Max and the others. They raised their hands and pointed it out ward towards the man. “Nice to see you Nasedo. I see you are trying to cause more trouble again huh,” Liz said. “You better watch what you say and do or you will be sorry,” Nasedo said. “Try it old man and you will see what happens to you,” Liz said. All of a sudden Liz was thrown across the room. Max ran up to Liz while Michael stood next to Serena. Max helped Liz up and walked her up to Serena and Michael. Liz raised her hand and threw Nasedo across the room. A few seconds later Nasedo walked up to Liz, Max, Ava and Michael. “This is not over yet. I will come back with the others,” Nasedo said. “You tell Senior Rath and Kivar that we will be waiting for them. If they want a war then they got a war. And we will end this once and for all,” Max and Michael said. Nasedo smiled and then he disappeared. After Nasedo was gone everyone turned and looked at Max and Michael. “What are we going to do now?” Liz, Serena asked. “We are going to be training is what we are going to do,” Cal said. “I'm going to change some of the rooms into a training room. We are going to be ready for anything and everything,” Cal said. “What about the parents, Maria, Alex, Kyle, Greg and Ricky?” Liz asked. “Oh don't worry they will also be training too,” Cal said. “Why do I have a bad feeling about this?” Maria asked. “We start training tomorrow at 6am. Today we all rest and have a day of family time together,” Cal said. The End Or Is it?????? Disclaimer: I don't own Roswell or the characters. I own the Queen, Khivar, Senior Rath and bad men, healers. Summery: After Max, Family, Friends finally find Liz and the others. They think that it will be a happy reunion but they are wrong trouble is just starting. Senior Rath, Khivar, Nesado finally find Max, Liz and friends and are bring the war to them. It will be the finally battle. Will Max, Liz and friends win the war or will history repeat it self? Cal was a great uncle. Yes Cal is/was a great uncle to all the girls. 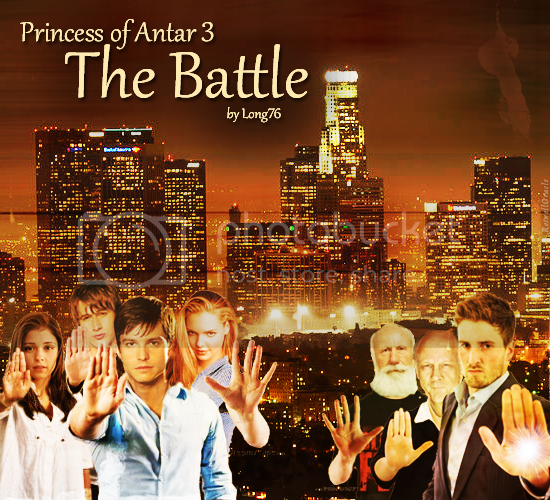 I'll be posting Princess Of Antar 3 between Spring 2017 - Winter 2017. So please keep an eye out for the new story and Chapter.